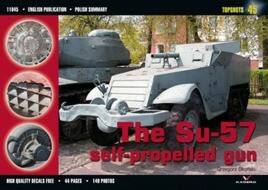 The SU-57 is a Soviet self-propelled anti-aircraft gun, armed with two 57 mm auto cannons. It was the first Soviet mass produced tracked self-propelled ant-aircraft gun. In the USSR it had the unofficial nickname "Sparka", meaning "pair", referring to the twin auto cannon with which the vehicle is armed. This album of detailed photographs is invaluable for the modeler or enthusiast alike. This is a classic series of highly illustrated books on the best machines of war, with several hundred photographs of each aircraft or vehicle. With close-up views of the key features of each machine, including its variations, markings and modifications, customizing and creating a model has never been easier. Includes extra features such as decals and masking foil.